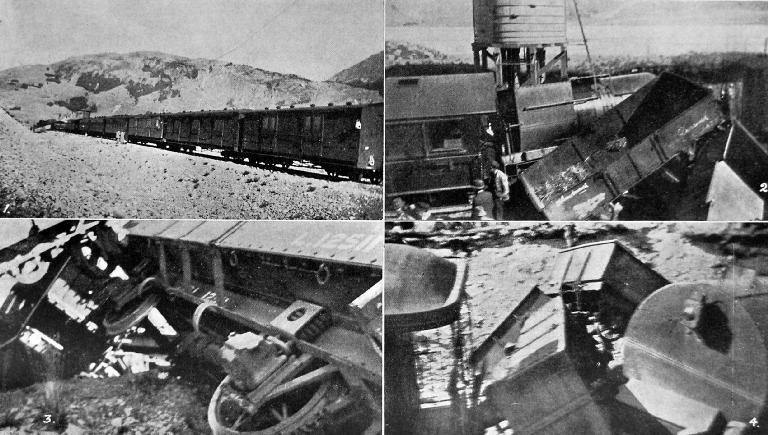 The Arthur’s Pass train derailed near Cora Lynn Station: some snapshots. Caption: The Arthur’s Pass train derailed near Cora Lynn Station: some snapshots. (1) The undamaged part of the train at Cora Lynn. The engine and foremost trucks are thrown off the rails. (2), (3) and (4) snapshots of the derailed engine and trucks. Description: The West Coast to Christchurch bound express, carrying over fifty passengers derailed near Cora Lynn, shortly after leaving Arthur’s Pass. There were no casualties and the driver and fireman narrowly escaped injury. The accident appears to have been caused by an unlocked set of points on the Arthur’s Pass side of Cora Lynn. The train was slowly approaching the station at Cora Lynn when the engine struck the half closed points and left the rails.